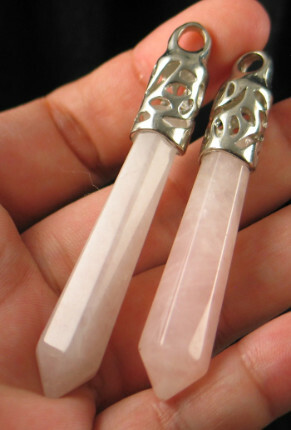 These are sweet rose quartz pendants. We currently have 2 available. One is slighly longer than the other. One measure 2.7" long the other 2.5". 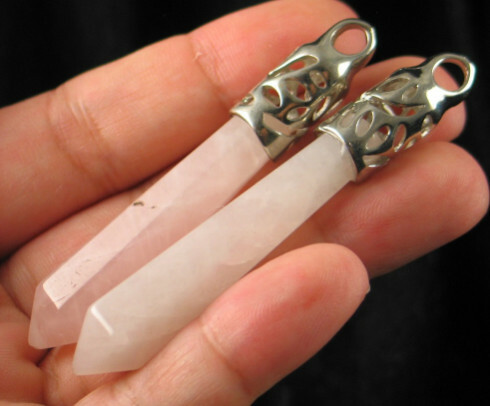 A lovely pendant to keep the loving energy rose quartz with you at all times. Quantity may be changed at checkout if available. Rose Quartz forms mostly in massive form, on rare occasion you can find crystalline formations or a beautifully translucent form we call gemmy rose quartz. Rose quartz is the pink cousin of quartz owing its hues to traces of iron and titanium. When ever you think of the heart chakra or a stone to love, you think of rose quartz. Its soft energy embraces the concept of love and self-love. Its energy is soft, but don’t discount the profound effect it can have on your system for there is strength there too. Your entire being benefits from good doses of loving energy. Rose quartz has a soothing energy that assists with the release of stress and worry. Its energy is perfect for everyone of any age, especially babies. Keep a piece near their cot or bed at night or at other sleeping times to ward away nightmares. It is a good stone to use during illness as its loving, supportive, and compassionate energy is profoundly soothing. On a physical level it works gently on the heart to soothe physical trauma and imbalances. Rose Quartz is a Master Healer on many, many levels. It teaches us that everything is Love. Place a Rose Quartz on your heart and imagine yourself breathing in the color. Let your mind relax and it can help show you the true situation behind the issues that trouble, through this understanding, you can release these issues. It makes for a powerful gridding crystal too, place a piece at each corner of your property and if possible a piece in the middle and you will be amazed at the difference in energy you will feel.